BonAppetour connects foodies and travelers with local home chefs around the world. Their mission is to make home-dining an integral part of every travel experience. From a paella making workshop on a terrace in Barcelona, to an exquisite Italian feast with a ‘nonna’ in Rome and a traditional tea ceremony experience in Tokyo, you can choose from a range of unique dining experiences hosted by their carefully selected host community. The BonAppetour team is continuously working to expand into new countries, cities, and towns to share the exquisite food prepared by warm hosts with the rest of the BonAppetour community. Meghan Miller is a high school English teacher by day and BonAppetour host by night. Three of her biggest passions are people, cooking, and eating. After a long day of teaching, she relieves her stress in the kitchen with flavors, spices, and textures as her medium. To Meghan, there is no other basic human ritual as beautiful as a meal, and to her, food was meant to be shared. She and her husband (Chris) live in a small apartment in a quiet neighborhood in the suburbs of Baltimore. They backpacked through Thailand together and have brought their love of Thai flavors home; they enjoy taking advantage of the plethora of Asian stores within an hour drive of their Columbia apartment. 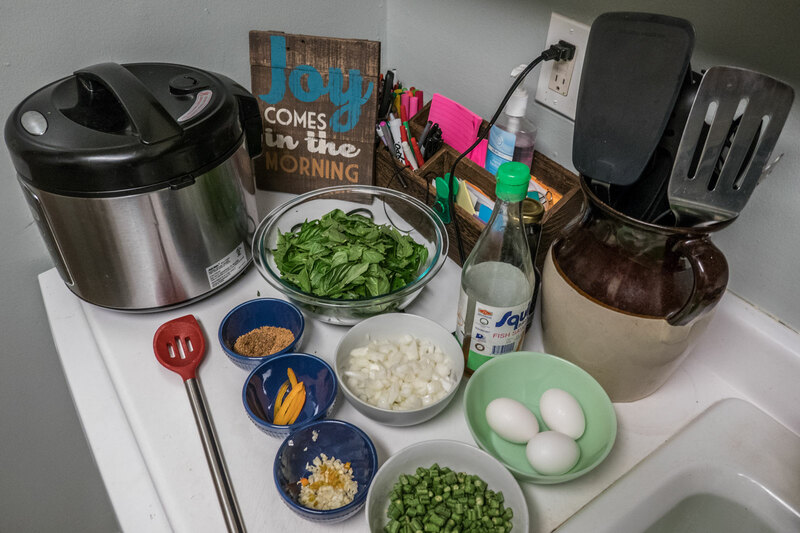 Thus, the ingredients they serve are the same ones that Thai people in Maryland are using! For those unfamiliar with Southeast Asian cooking, the word papaya may conjure up images of the vibrant sweet fruit that really does taste great, but is less filling. Although sweet papaya is plentiful (and affordable) throughout Thailand, som tum uses the more sour (green) papaya. The dish is slightly spicy, but not filling. This simple yet flavorful dish causes much debate among Thai food purists. Some insist that pad ka prao is not pad ka prao without holy basil. 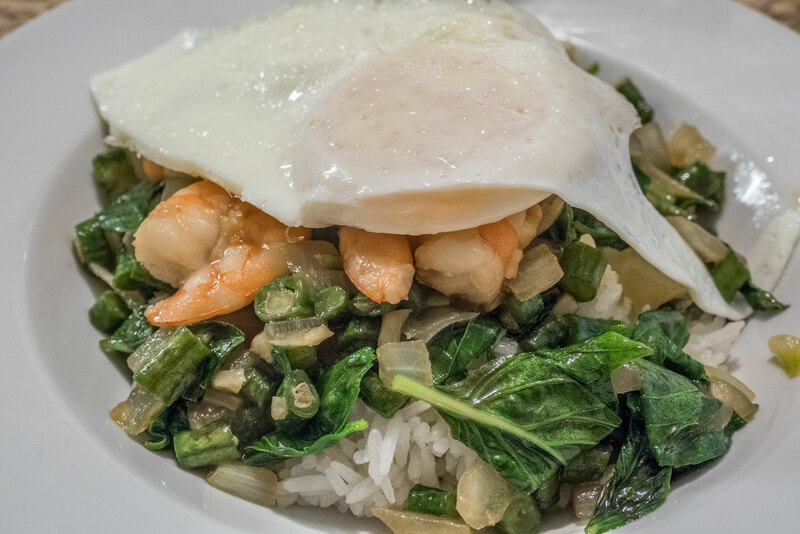 Meghan used shrimp, a fried egg, holy basil and serves it over jasmine rice. 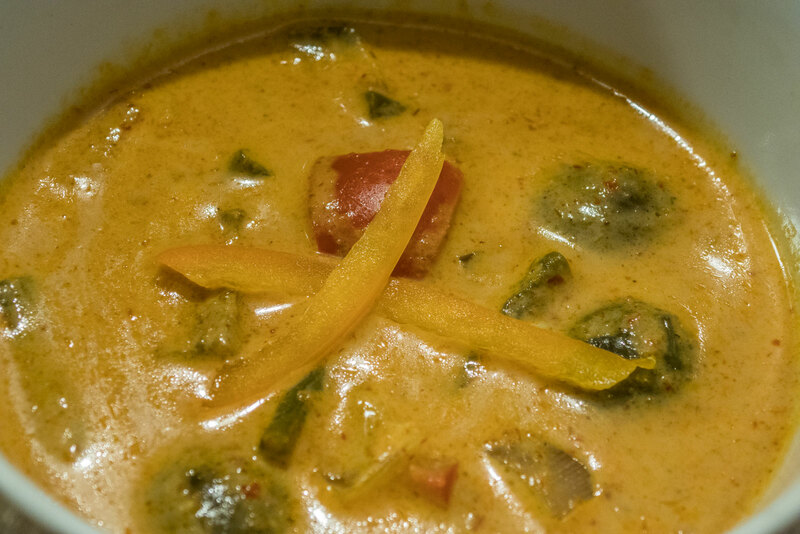 Penang curry is creamy, slightly sweet, and spicy. Often made with chicken and vegetables, it can also be made vegetarian. Meghan serves it with jasmine rice (fragrant white rice), which can help temper the spice for those who prefer a more mild taste. 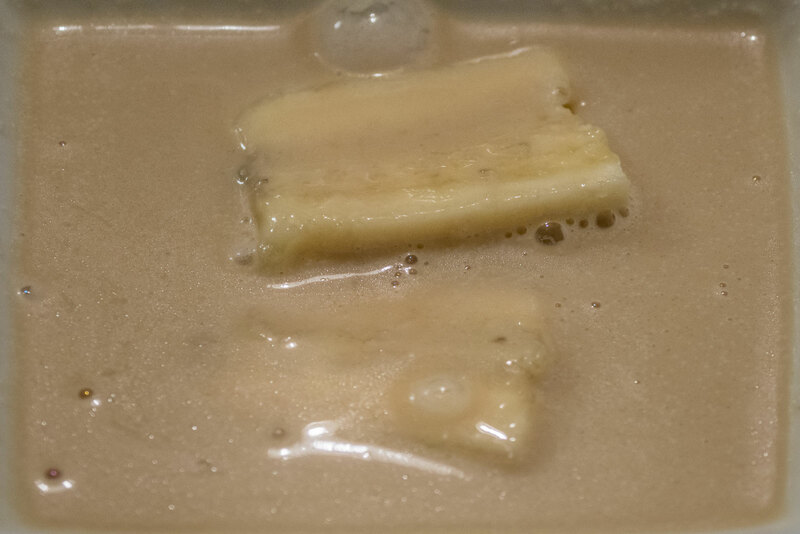 This simple dish of bananas in coconut milk is popular in Thailand as well as all of its neighbors. It’s creamy, sweet and has just a hint of salt, which balances the dish perfectly. After eating the bananas, you can drink the sweet (and just a bit salty) coconut milk! Although the food was delicious, the cozy atmosphere and warm hospitality was the highlight of A Taste of Thailand. Chris and Meghan are true raconteurs and have travel stories to match everything Meghan cooks. It takes courage to invite people you’ve never met into your house and cook them dishes from halfway around the world. 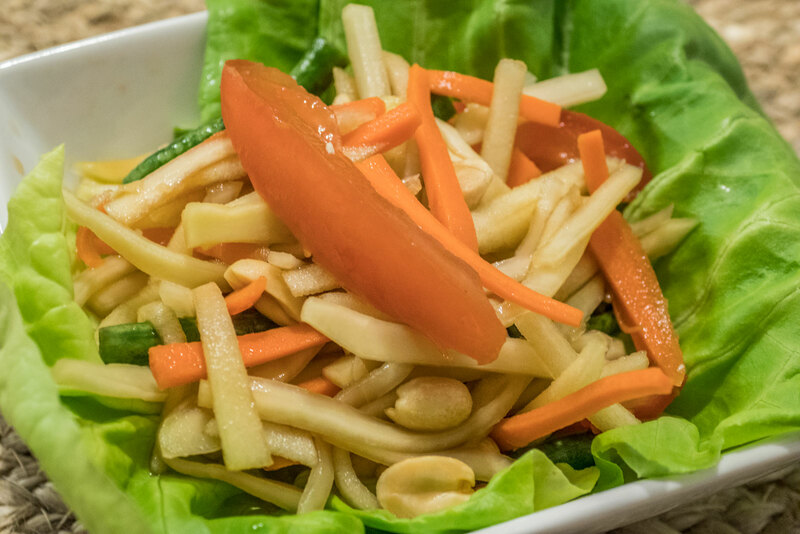 Click HERE to read more about A Taste of Thailand and other BonAppetour dining options. Click HERE to read more about Meghan’s travel and foodie adventures on her personal blog. Compare hotel prices, read reviews and book your Baltimore hotel at TripAdvisor! What a fun idea. We lived in DC prior to leaving for out RTW travels. May just have to go back to set up an evening of dining and swapping stories. Such a great idea! Food is one of the best parts of travel! So you go and do in-home cooking with people in a city you’re visiting? That’s so cool! I would be interested in doing this almost anywhere. Heck, I’d be a host to teach people visiting Seattle how to cook salmon and mussels. Really cool idea. Yes, click in the links for more info. I had a wonderful time! This is such a great idea! I didn’t hear about anything like it before but I would be very interested in trying it out. I like that besides the meal, you get a nice homey atmosphere and enthusiast people to talk to and discover other corners of the world. That’s a fantastic idea! I have heard that similar type of in-home cooking is also available here in Hungary but haven’t found any and not so sure how it would work here. It doens’t need to be anything fancy, just good food made of fresh ingredients, nice people around – those makes a perfect cosy evening. I never heard of the Bonappetour but really like the concept! I think it’s a great idea! The dishes that Megan and Chris served looked delicious! I think this is the best recipe for a fun evening and meeting new people! It’s amazing when you can taste authentic dishes from other countries so close to home. 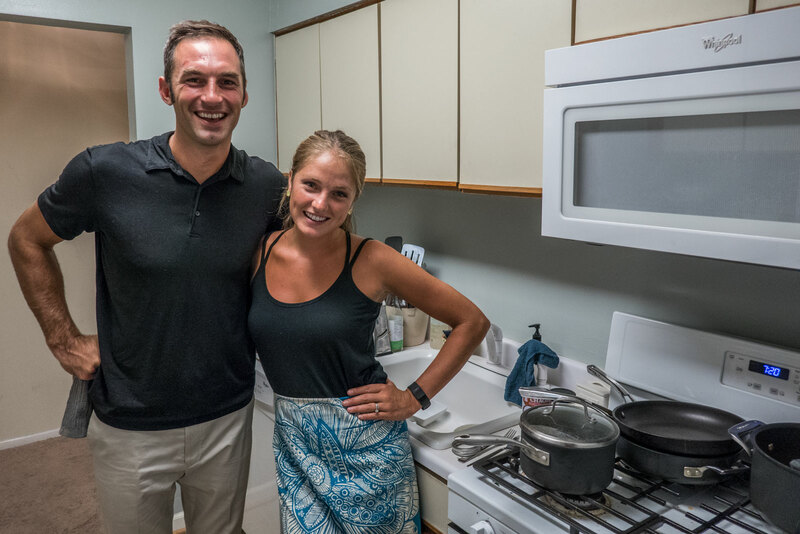 I love what this husband and wife duo are doing, they’re introducing good Thai food to a lot of people! This is a great initiative! It’s nice to let people taste a food that’s completely different from what they usually have everyday. I think this is a nice learning experience as well. YUM!!! That is such a great idea! Food is the best part about going new places. I love how you found a way to bring it back home! I really like the idea of Bonappetour. Meghan’s Pad Ka-Prao sounded super good. I’d be excited to try the Papaya salad too. Wow..this is a great idea!! It gives a nice boost to the home chefs where they can showcase their home cooking. Lovely…. What a great post! The foods are all delicious. What a cool idea! The food looks amazing and I’d love for a home chef to come and make it for me! Love that innovative idea! Food is an integral part of my traveling as I love trying local cuisines! Have you been to Lucali in Miami Beach, Ana? Oooh wow! Everything looks delicious. We can’t wait to visit Thailand. Thank you for sharing! You just had a very wonderful experience here. It seems cooking local cuisines is very common in Southeast Asia than Europe. I would for sure would love to try this in Thailand and other countries when I get the chance again. You had a wonderful experience there in Thailand! It seems cooking local cuisines while traveling is common in Southeast Asia than in Europe. I will for sure try this again when I go to Southeast Asian countries. Ah, I so love Thai food! This is a great organization! I would definitely check which countries they have. One thing I am sure I will do in Thailand is to go on some kind of cooking class or food tour. Thai food is one of the main reasons I want to visit. I want to take a nosedive into that curry, oh that looks so good! Great post, blessings! I love the concept and the salty but sweet bananas sounds delicious as does the Jasmine rice. How tasty! This is such a great idea! I had never heard of Bonappetour but will definitely see if I can try this out somewhere during my travels! Such a great idea – I’m going to look this up when I’m travelling next! This sounds like a fantastic experience! What a great way to relive your travel experiences… food, food and more food! Taking a cooking class is on my list of things to do when we start slow traveling more. I had never heard of Bonappetour, but it sounds like a fantastic idea! What a great idea! Cooking classes are the best way to really get to know a culture. We did one at a private home in Koh Samui in August and it was definitely the highlight of our trip! I would love to do a cooking class like this! I love eating Thai food so I would especially love to know how to cook it! Fabulous idea! What a great way to swap stories too. The food looks delicious – love Thai food (especially Holy basil). Bonappetour is a great idea to combine travel with food, people and the experience. 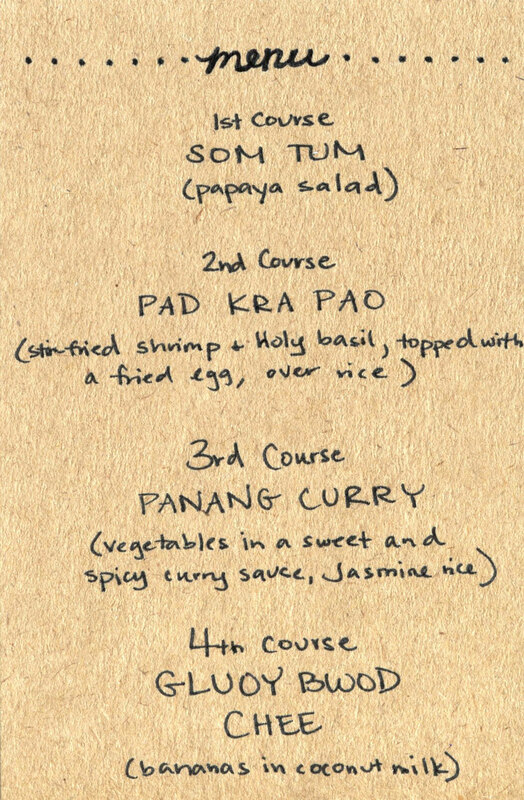 I am a huge fan of Thai food and this post makes me hungry, especially the basil shrimp. Always want to take a cooking class to learn the in and out of the Thai cuisine.